Edvard Munch (1863–1944), Woman in Three Stages (1894), oil on canvas, 164 × 250 cm, Bergen kunstmuseum, Bergen, Norway. Wikimedia Commons. I hope that you have enjoyed this series, which began by looking very briefly at Edvard Munch’s extraordinary life, career as an artist, and paintings. As I explained, my main interest was in trying to assemble and read his Frieze of Life, predominantly paintings which he made during the 1890s, exhibited several times as a series, and among which he lived much of his life. Many of that series are individually narrative paintings, telling parts of his life story, particularly its emotional turmoil. 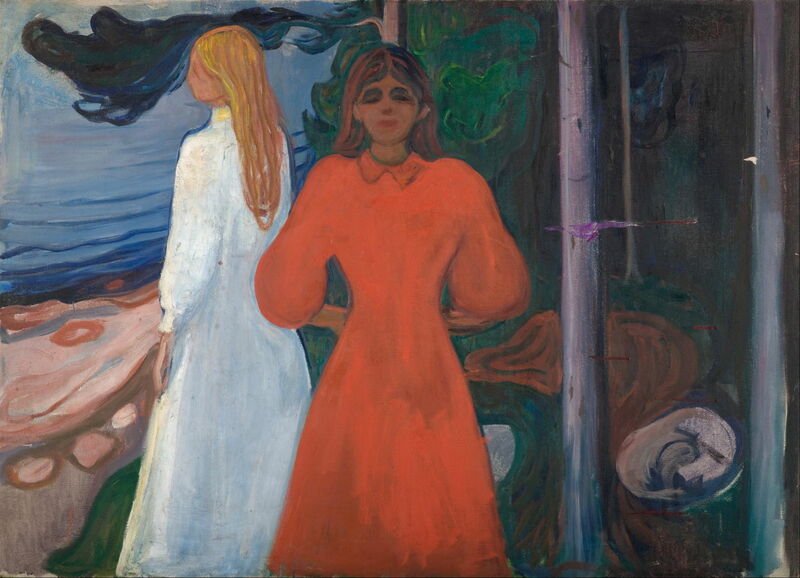 Although the series stops well short of the crisis which Munch underwent in 1908, and his recovery thereafter, its individual works and the series which they form must be among the most intensely autobiographic paintings by any artist. 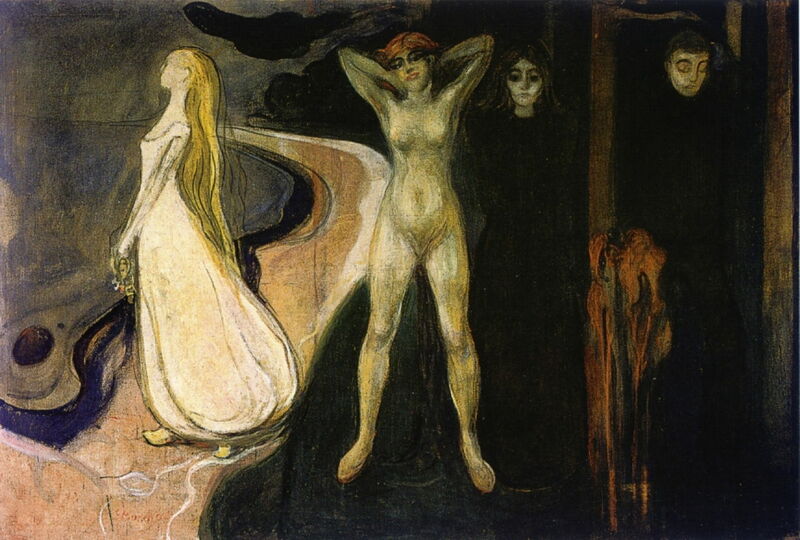 In terms of narrative technique, within at least one painting (The Dance of Life, 1899-1900), Munch uses multiplex narrative. The whole series forms a higher-level narrative on top of those individual scenes. 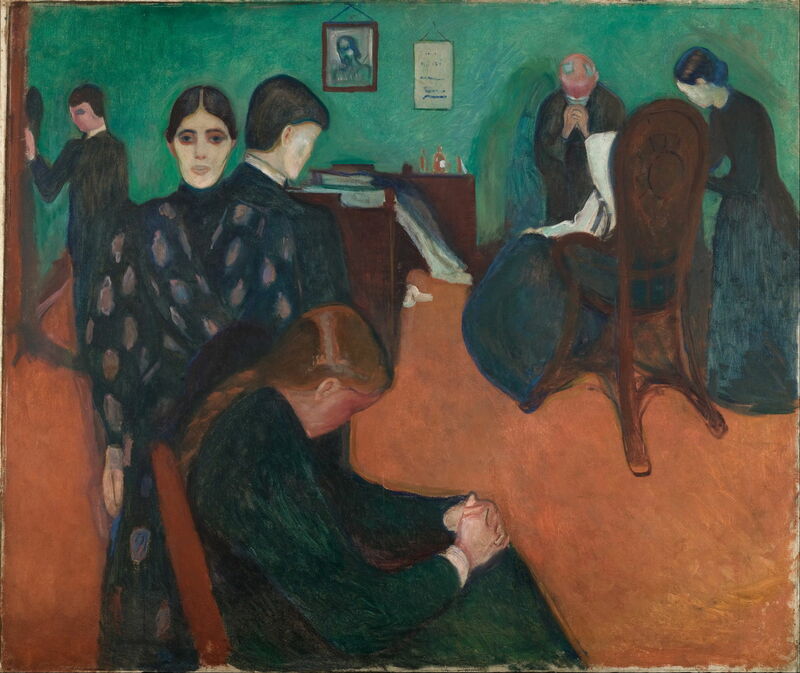 Works which depict deep emotional states, like The Scream, come together to compose a visual account of Munch’s life, loves, fears, and anxieties from his childhood in the late 1860s to about 1902. Here then is a whistlestop tour, uninterrupted by my distracting commentary, of a selection from Munch’s Frieze of Life, followed by two indexes to the articles here. The first Frieze of Life, exhibited in Berlin in 1895, is detailed in article 1. Subsequent articles show his second version, first exhibited in Berlin in 1902, which is divided into four sections. Edvard Munch (1863–1944), Summer Night’s Dream (The Voice) (1893), oil on canvas, 88 × 108 cm, Museum of Fine Arts Boston, Boston, Massachusetts. Wikimedia Commons. Edvard Munch (1863–1944), Red and White (1899–1900), oil on canvas, 93 x 129 cm, Munchmuseet, Oslo. Wikimedia Commons. 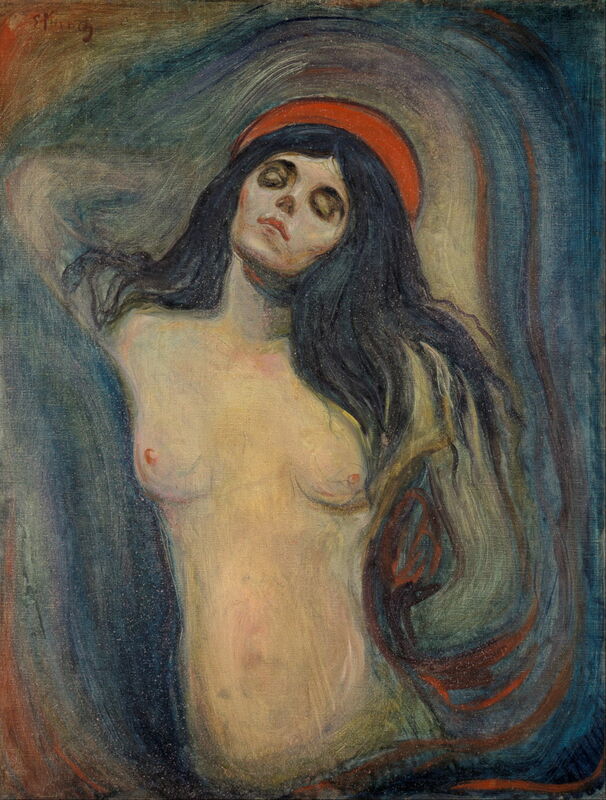 Edvard Munch (1863–1944), Madonna (1894), oil on canvas, 90 x 68 cm, Munchmuseet, Oslo. Wikimedia Commons. 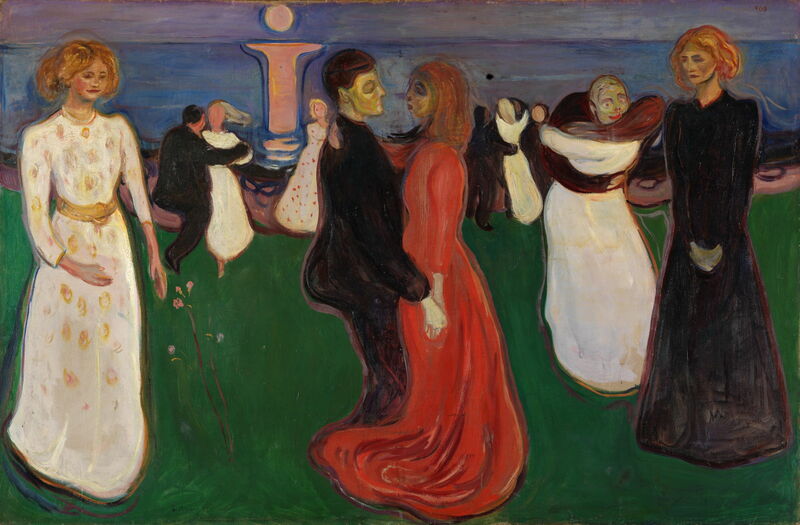 Edvard Munch (1863–1944), The Dance of Life (1899-1900), oil on canvas, 129 × 191 cm, Nasjonalgalleriet, Oslo. Wikimedia Commons. 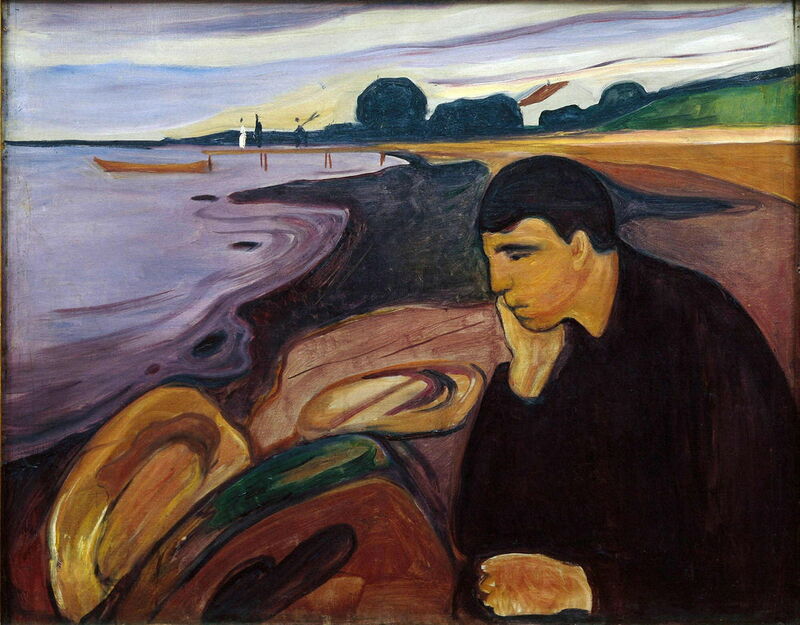 Edvard Munch (1863–1944), Melancholy (1894-96), oil on canvas, 81 × 100.5 cm, Bergen kunstmuseum, Bergen, Norway. Wikimedia Commons. 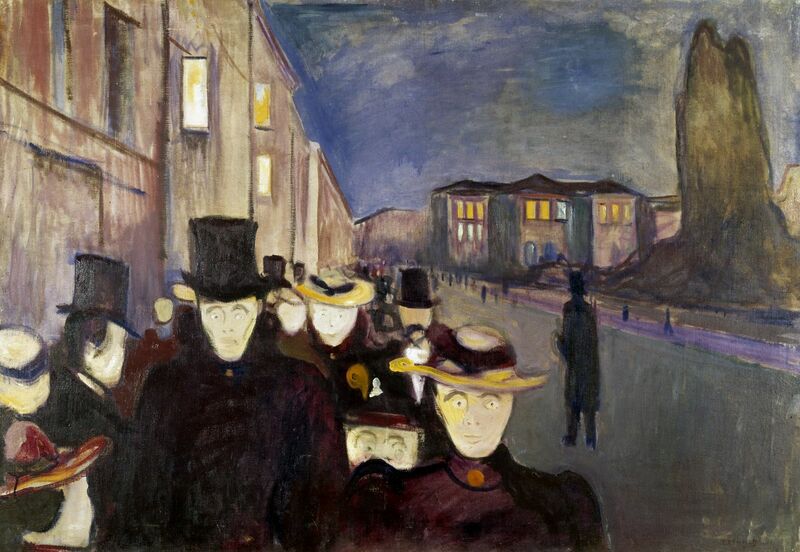 Edvard Munch (1863–1944), Evening on Karl Johan (1892), oil on canvas, 84.5 × 121 cm, Bergen kunstmuseum, Bergen, Norway. Wikimedia Commons. 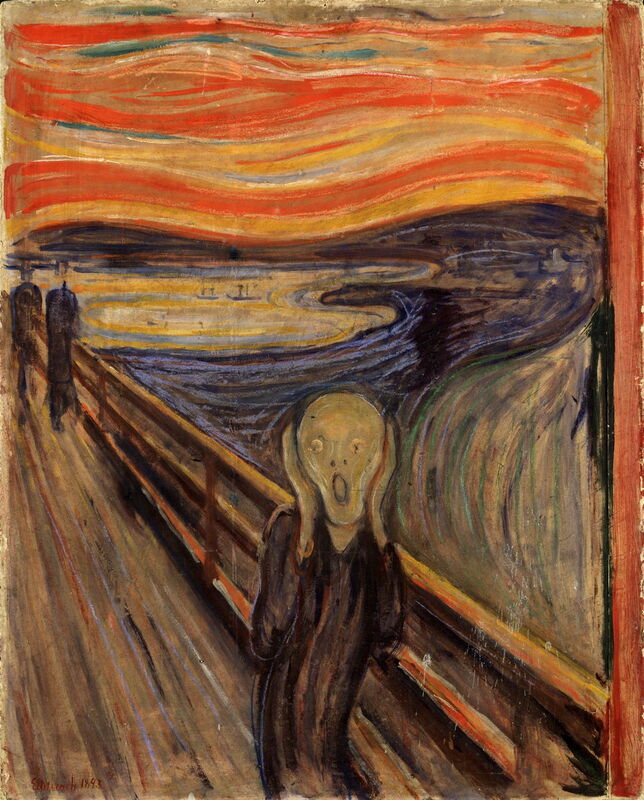 Edvard Munch (1863–1944), The Scream (1893), oil, tempera and pastel on cardboard, 91 × 73.5 cm, Nasjonalgalleriet, Oslo. Wikimedia Commons. 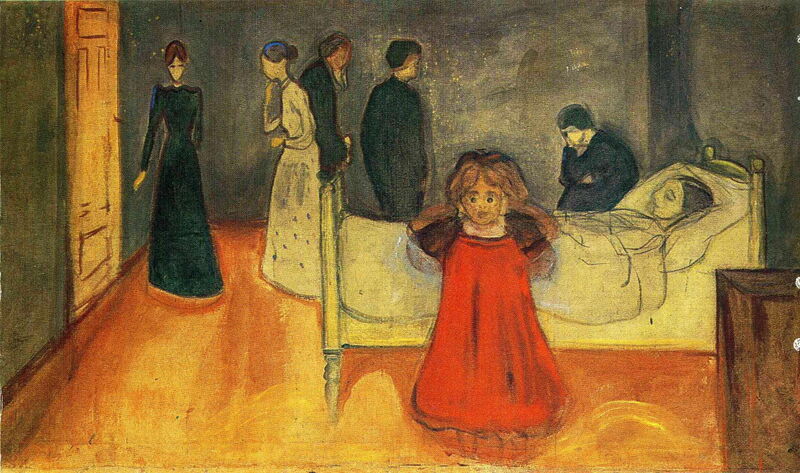 Edvard Munch (1863–1944), Death in the Sickroom (1893), oil on canvas, 134.5 x 160 cm, Munchmuseet, Oslo. Wikimedia Commons. Edvard Munch (1863–1944) Dead Mother and Child (1897-99), oil on canvas, 105 × 178.5 cm, Munchmuseet, Oslo. Wikimedia Commons. Index of Paintings, including common synonyms. These are referenced by the painting number cited in each article. Index of People Depicted or Mentioned These are ordered by last name, and referenced by the painting number cited in each article. Collection at Norway’s National Gallery. Wood, Mara-Helen (ed) (1992) Edvard Munch, The Frieze of Life, National Gallery Publications. ISBN 978 1 857 09015 4. 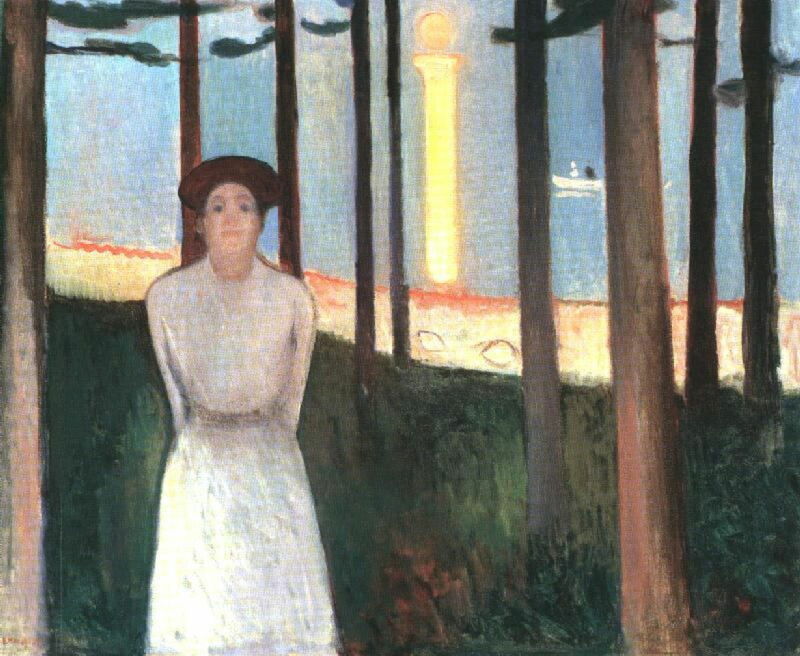 Posted in General, Life, Painting and tagged Munch, narrative, Norway, painting, series. Bookmark the permalink.